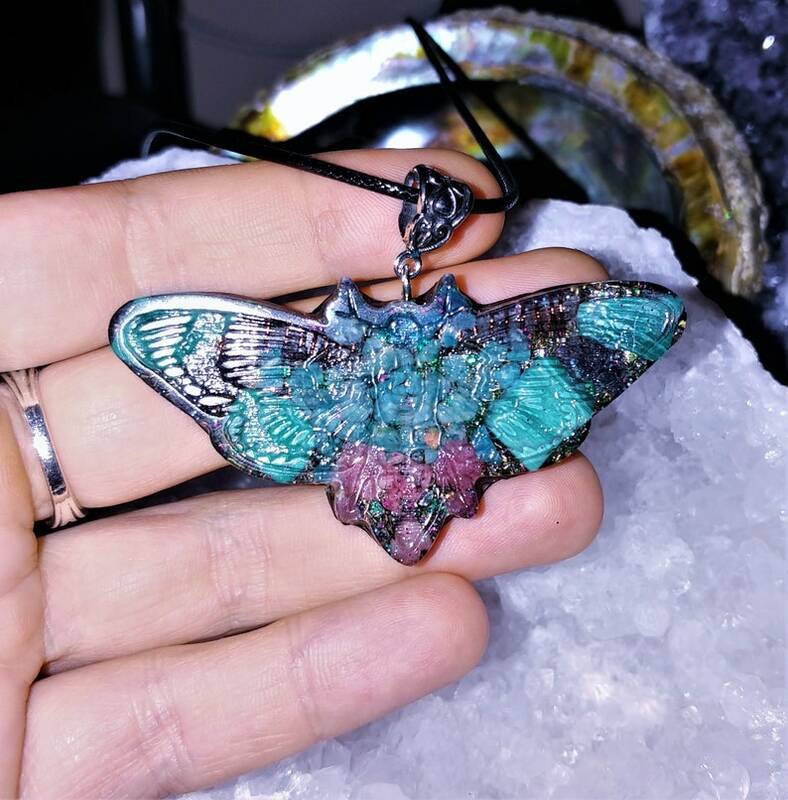 It contains 2 terminated Clear Quartz Crystals, iolite, Blue Apatite, Pink Tourmaline, Malachite, Amazonite & Shungite powder, Mica Flakes, 24 K gold flakes, Metal shavings, Sage, Rose Petals, Copper coil, Black Sun Iron Oxide nano powder, jewelry grade epoxy resin. The moth has been both admired and feared in various cultures all over the world dating back to ancient times. To some Native American tribes, moths were thought to be sacred and powerful creatures and there is even talk of moth cocoons being used as rattles in certain Californian Native tribes. Others view the moth as a symbol of death or a messenger from the dead. This can be seen in the symbolism of the deaths-head hawk moth. This particular moth has a skull pattern on its back. One thing is for sure - the moth is a powerful totem and animal spirit guide. Whether it causes fear or awe, it causes a strong reaction in its beholder. Moths represent three main ideals: mystery, darkness/light, and transformation. It is possible the moth spirit guide is trying to teach you the mysteries of the occult. The ancient mysteries of your ancestors. If one particular moth is coming to you often, research and find out what kind of moth it is and whatever the folklore or mythology is behind it. You might find your answer in your research. If not, let the moth continue coming to you until the message is loud and clear. It is possible you have been hiding from something in your life and the moth is here to bring it into the light. To draw you to the light, just as moths are drawn to the light. It is also possible that some of the mysteries in your life are about to be revealed. Let the moth be your guide out of the darkness and to the light. Size - height: 1.5" - width: 2.5"
Comes on FREE 18" cord necklace. Every orgone necklace need to be charged in the sun light or moon light from time to time (to clear negative energy and to recharge it). Also it is beneficial to place it near Selenite crystals - they are known as cleansing stones. Organite is a substance which functions as a self-driven, continuously-operating, highly efficient energy transmutation device, drawing in negative life energy and transmuting it into positive energy. It is reputedly protects one from harmful EMF radiation. Some people feel increased energy and a greater sense of well being when wearing or being in the vicinity of orgonite. Organite is made with metal shavings and epoxy resin. Quartz and copper are popular ingredients due to their conductive properties. The resin is poured over the quartz and metal shavings, and it shrinks as it hardens, exerting pressure on the quartz, permanently squeezing the quartz crystal inside which creates a well-known piezoelectric effect inside the crystal, meaning its end-points become polarized electrically, this apparently causes it to function more effectively as a positive energy generator. Having an orgone product on you is like having an energy transformer in your energy field. It will clean up stuck or armored energy structures in your energy field. Of course, how much it will be effective also depends how old and strong the armored energy structures are. Organite can be effective immediately or it might take a long time. But it is always working. Such a beautiful necklace!! It arrived super fast and well packaged. I haven’t taken it off since I received it! Thank you for creating such a gorgeous and powerful necklace!